Are you getting married? Maybe you are a bridesmaid or have received an invitation to a wedding? If so, we are here to help with your hair! 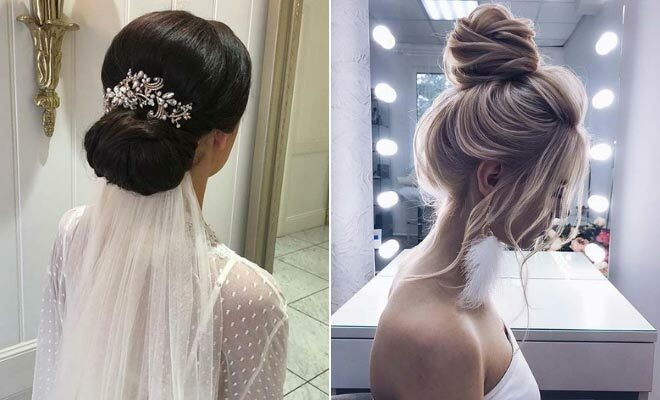 We have found 23 stunning wedding updos that are perfect for the special day. You will find beautiful bridal looks, pretty braided hairstyles, elegant ponytails and more. There is something for everyone, you won’t be able to decide which one to wear! 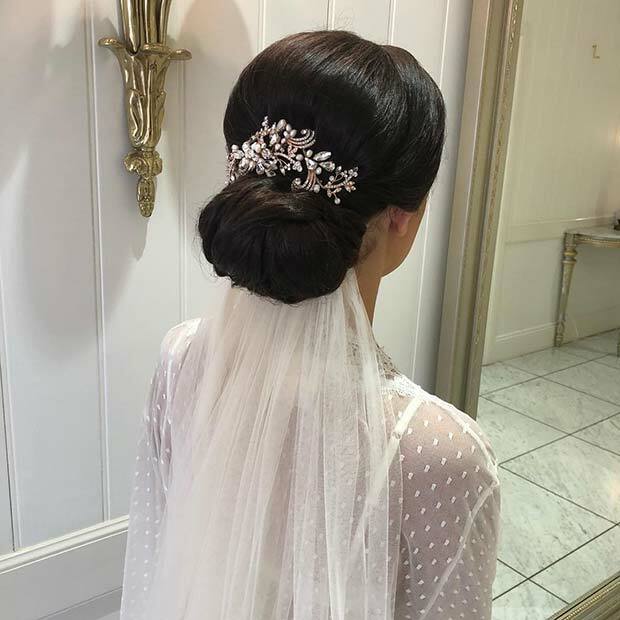 The first wedding hairstyle we have to show you is this classic updo. For this look the hair is beautifully styled into a low bun with a stunning hair accessory. The updo is finished off with a veil. Recreate this for an elegant and traditional bridal look. You can also use the bun for bridesmaids hair too, just remove the veil and choose different hair accessories. 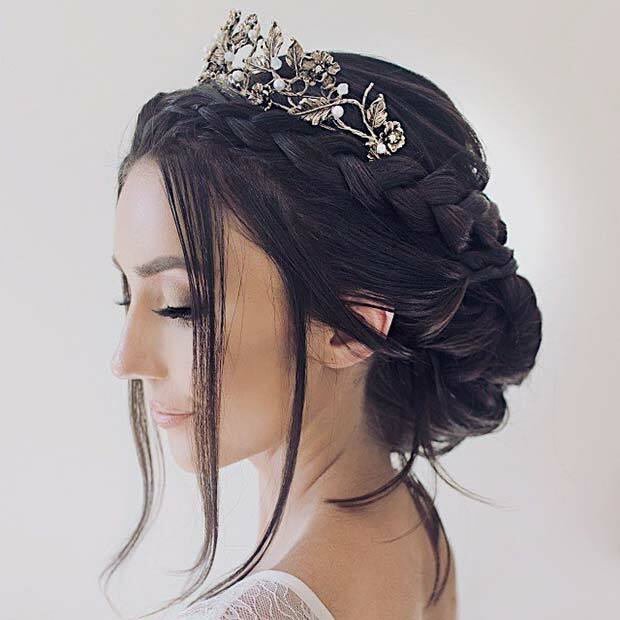 Feel like a princess on your big day with hair like this! The hair is styled into a high updo with beautiful curls. It is a very elegant hairstyle that will wow everyone who sees it. Finish the look with some hair accessories like pearls, gems, flowers, a tiara or a veil. Speaking of tiaras, here is a beautiful way to wear one. This hairstyle features a crown braid that ends in a low updo at the back, there is also loose hair at the front too. 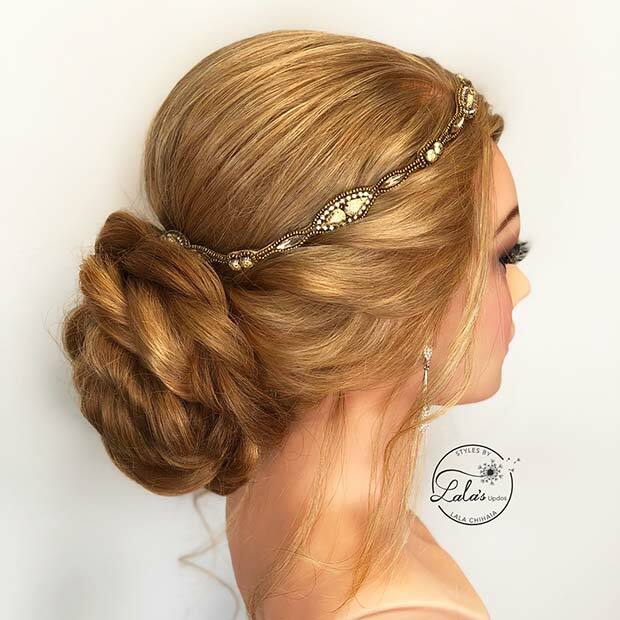 It is a romantic and elegant hairstyle that would look amazing at any wedding. You can recreate this with any tiara. The hair would also be great for bridesmaids, just maybe without the accessory. Flowers are a beautiful way to accessorize for a wedding, whether you are the bride, bridesmaid or a guest. Here we have a gorgeous curled updo with added pink and white flowers. Recreate this look if you are the bride. Maybe try different colored flowers for bridesmaids. If you are a guest, choose a different color and maybe only add one or two flowers. Next, we have a chic bun. The hair is quite relaxed with loose hair at the front and the bun is styled very high on the head. This is a stunning updo that can be worn by the bride, bridesmaids or guests. You can jazz it up with accessories. 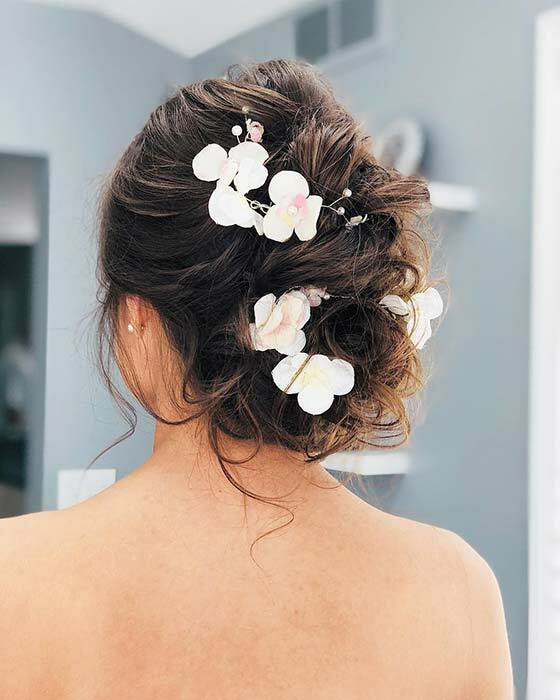 An updo like this would be perfect for a summer or beach wedding. Braids may not seem like a formal hairstyle for a special event but that idea will change once you see this updo. This hair has been beautifully braided down the back of the head and turned into a bun at the end. It is an elegant and romantic hairstyle because the braid is loose. A braid like this can be worn by anyone attending the wedding. It can be glammed up with accessories too. Are you a bride with a boho theme wedding? This is beautiful hairstyle that you could try. The hair is very loose and features a fishtail braid crown. 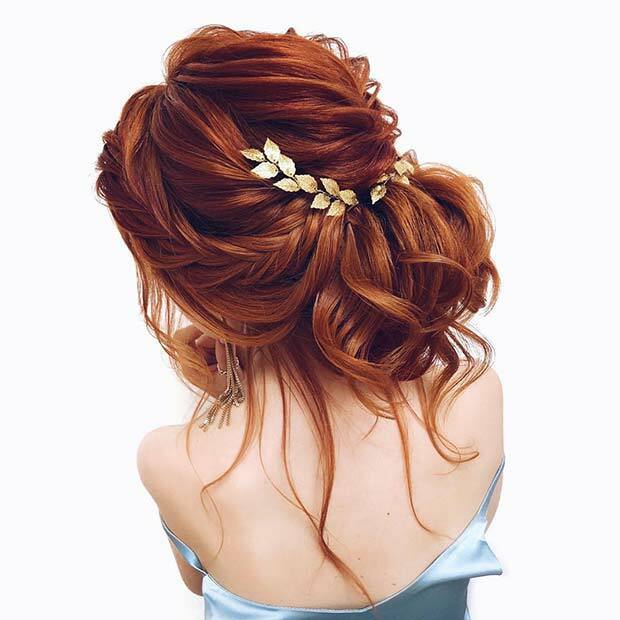 It is a low bun style with a gorgeous gold accessory. A hairstyle like this would look amazing with flowers. Our next idea has a vintage glamour vibe. The hair has a stunning braided bun with a beautiful hair accessory. You can buy accessories like this one or you can even use a necklace. 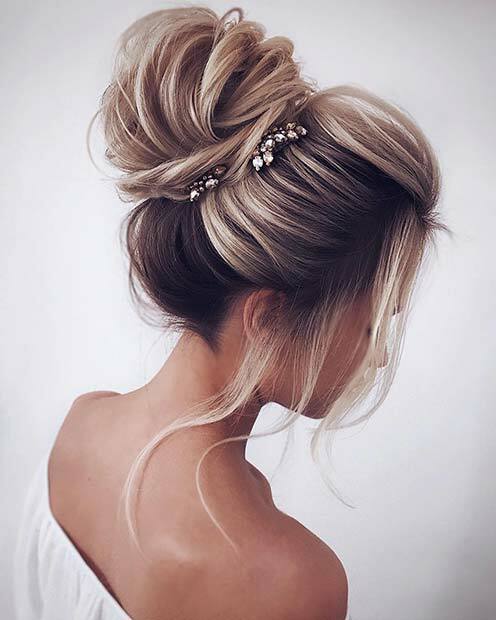 There are lots of tutorials and ideas online so you can create a gorgeous bun like this with a unique and chic necklace. Hair like this will suit any wedding. If you liked the chic bun that we featured earlier then this hairstyle is for you. For this one the hair has again been styled high on the head with loose hair at the front. The difference is the glam accessories. As you can see, hair accessories like this really glam up the look. This is also the perfect hairstyle for the bridesmaids or guests. Next, we have a ponytail that looks straight from a fairy tale. The hair has been beautifully styled into a waved ponytail. There are also strings of big and small pearls weaved into the hair. This is a stunning hairstyle that will wow! You can recreate the ponytail or try pearls like these on a different updo like braids or a bun.